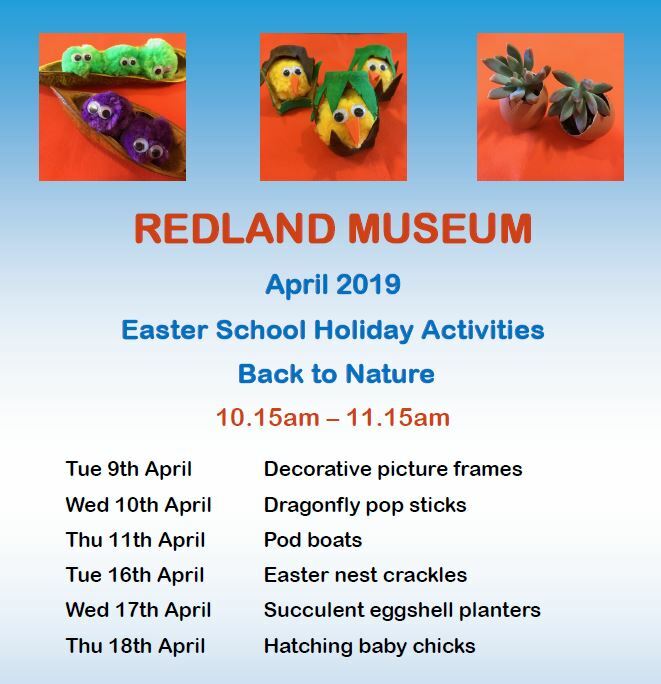 Redland Museum once again has some fun activities to entertain the young ones (and young at heart) during the Easter school holidays. Children will get in touch with nature, create and decorate some wonderful things. You will be amazed at what you can create from nature's warehouse. A different activity each day (Tuesday to Thursday) each week of the holidays! Don't miss these great holiday activities for parents, grandparents, and kids of all ages, come and visit the museum these school holidays and enjoy not only the exhibition but all the wonders the museum has on offer including the Australian Toy Hall of Fame. Book your spot today by clicking here to access our calendar and select the day/s you wish to attend! You can also book over the phone by calling the museum on 3286 3494! 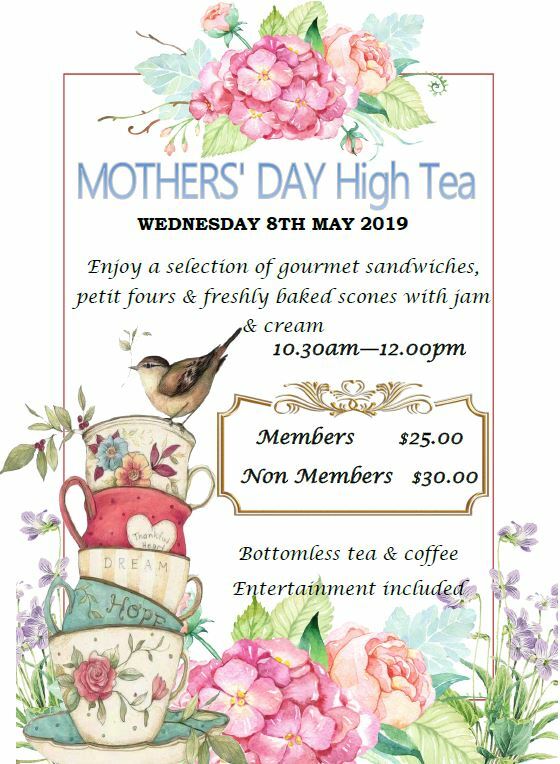 At the Redland Museum, we celebrate motherhood and honour our mums by hosting a Mother's Day High Tea. Our high tea includes a selection of gourmet sandwiches, petit fours, freshly baked scones with jam & cream as well as bottomless tea & coffee. Entry to the museum and entertainment is included. Let's celebrate Mothers Day together. The history and maintenance of Peel Island – 2019 update in which Peter highlights Peel Island’s history and its future when placed under the full control of the Quandamooka People. Peter Ludlow, a pharmacist and historian, is the author of many publications. In addition to his Moreton Bay researches, he has written works including the history of Brisbane’s Mater Hospital pharmacy, Queensland’s German connections and the history of the Port of Brisbane. He has written a book for the Museum of Brisbane’s exhibition ‘The Many Lives of Moreton Bay’ and for the Cleveland Library, ‘World War 1 Heroes of the Redlands’. Another project has been the collection of all his writings about Peel Island’s Quarantine Station and Lazaret. Rick touches on three generations of the artistic and compassionate Agnew family who were associated with Dunwich and the Benevolent Asylum. Rick Thomason OAM, has since 2000 been Exhibitions Officer at Redland Museum, curating exhibitions at two monthly intervals. 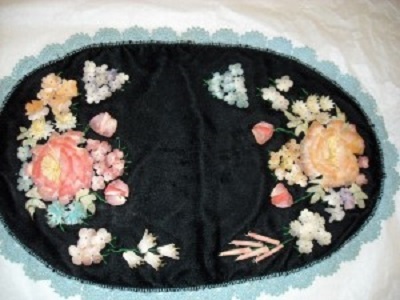 These include major exhibitions relating to the history of the Redlands and its prominent characters. 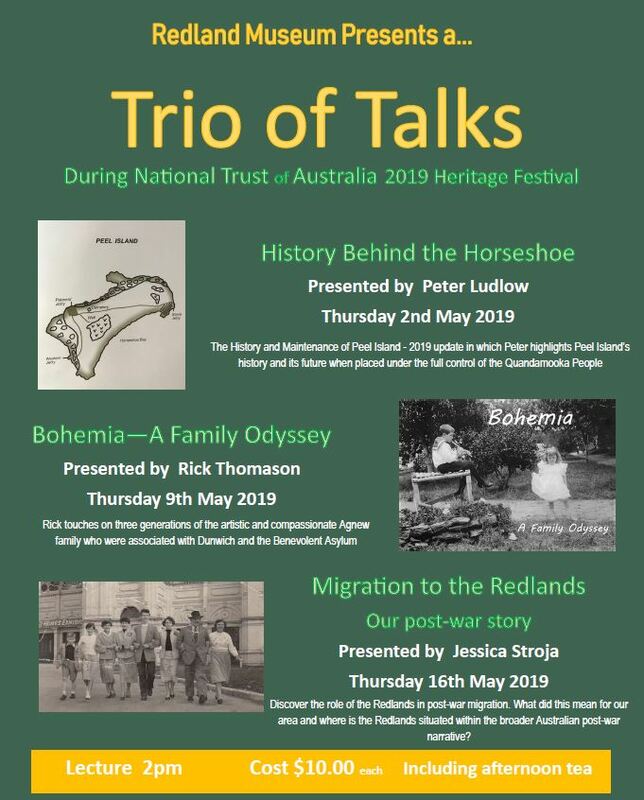 The exhibition ‘Bohemia – A Family Odyssey’ in collaboration with North Stradbroke Island Historical Museum presented in 2017 is the subject of this lecture. Discover the role of the Redlands in post-war migration. What did this mean for our area and where is the Redlands situated within the broader Australian post-war narrative? Jessica Stroja, Resident Historian and Pianist at Historic Ormiston House is a PhD Candidate at Griffith University. Her research surrounds migration caused by conflict and the effects of wartime experiences. She maintains a strong interest in museums and local history and their relevance within the surrounding landscape. CLICK HERE to access our calendar & select the talk/s you wish to attend! For phone bookings please call the museum on 3286 3494! 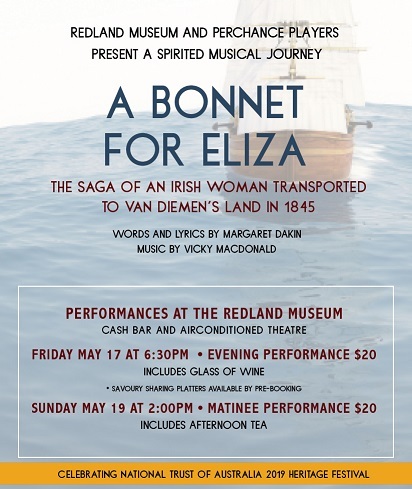 About the Play - A true story of Eliza Davis, an Irish woman who was to be hanged for the alleged murder of her baby till her sentence was commuted to life in Van Diemen’s Land. After the death of her son in Ireland, she arrived in Australia in 1845. Unable to read or write, she nevertheless proved to be a resilient woman. who made a decent and useful life for herself and the nine children she gave birth to in this country. A Bonnet for Eliza is a spirited musical journey based on facts researched by Gail Mulhern who is the great great granddaughter of Eliza. At our evening performance, you will receive a complimentary glass of wine and have the option of purchasing savoury sharing platters, served before the play. There will be a cash bar to purchase drinks. Click Here to book your ticket to our evening performance and order your platter! At our matinee performance, you will receive a Devonshire tea before the play, the cost of which is included in the ticket price. Click Here to book your ticket to our Matinee performance. The theatre is air-conditioned for your comfort! 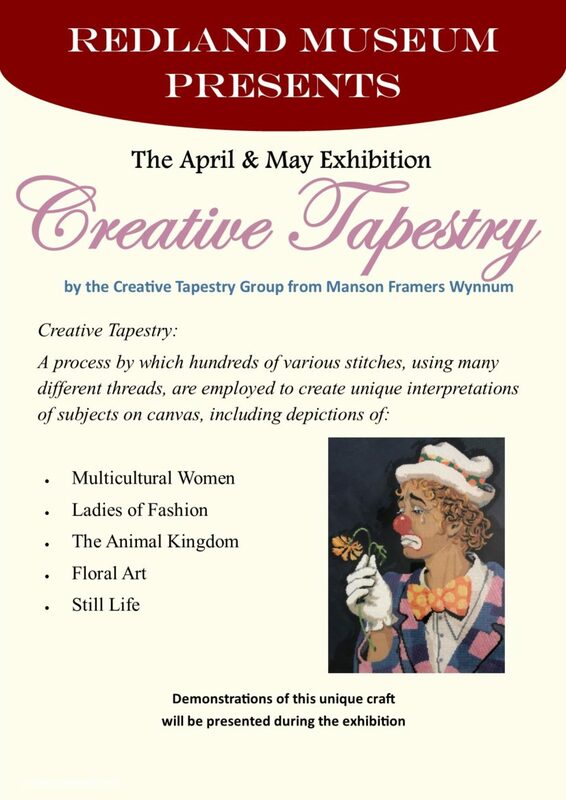 Our latest exhibition Creative Tapestry is a display of works undertaken by a dedicated local group established over 25 years ago. The group meets at Manson Framers, Wynnum on Saturday morning. 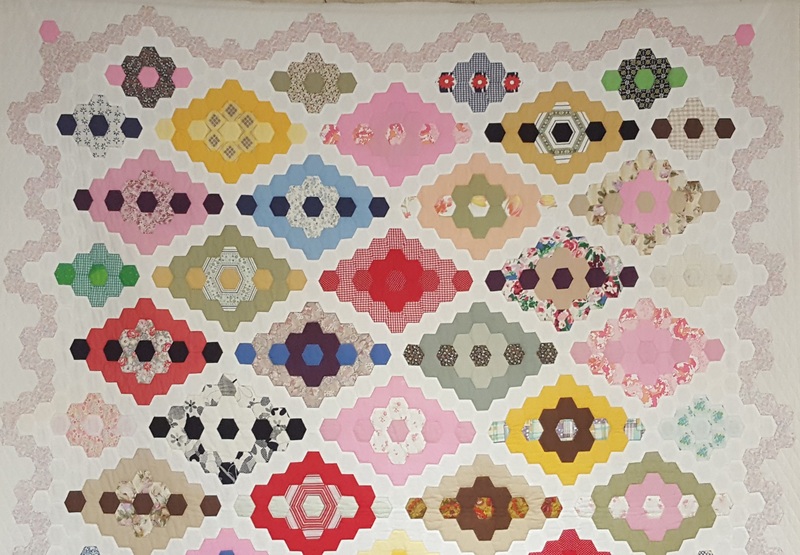 The exhibition features a wide variety of subjects, all of which have been selected as outstanding examples of the work undertaken by the group. The tapestries contain scenes such as women of different cultures "Miss Taj Mahal", fashionable ladies during the 1920's " Flappers", rustic scenes "Cottage Garden" and many different scenes featuring animals "Girl with Cheetah"
At various times throughout the exhibition, demonstrations will be held by the group members of their work. Also on display are samples of basic canvases, threads, and tools used by the artists in the creation process. 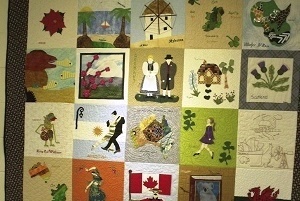 Many members of the tapestry group are long-time residents of the Bayside region and have a desire to promote their unique craft to others within our community. We can make your outing extra special by providing morning or afternoon tea or lunch. Please advise your catering requirements 7 days prior to your visit. Click here to view our catering menu. Contact Us to make a booking! Why not visit the museum as a school group or social group. We cater for groups of any size and can arrange for our volunteer guides to show you around. We can also provide morning or afternoon tea or lunch! Please advise your requirements 7 days prior to your visit. View our catering menu here. Contact Us to make a booking! 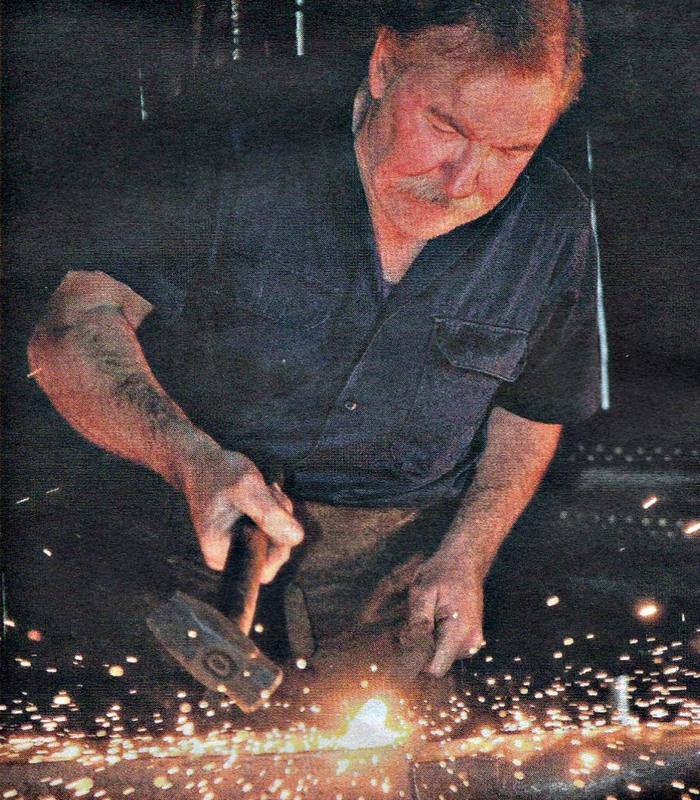 The Redland Museum is fortunate to have a fully working Blacksmith Shop. Most Saturdays you will find a smithy or two, led by our head Blacksmith Paul Jones, working on a new project for the museum. The current work is to build a screen for the side of the blacksmith shop; call in and see them at work.